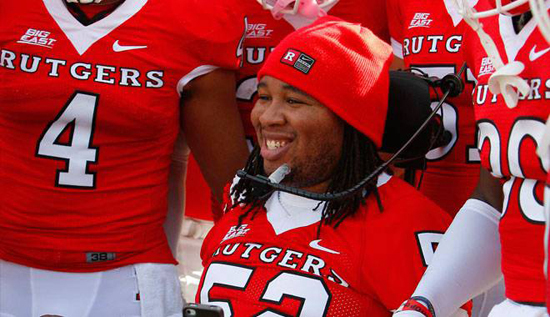 Paralyzed Rutgers football player Eric LeGrand has been selected to receive the Jimmy V Perseverance Award at ESPN's ESPYS July 11. LeGrand suffered a spinal cord injury in a game against Army in 2010. Initially told he would be a quadriplegic and would remain on a ventilator, the defensive tackle is now breathing on his own and can stand upright with the aid of a metal frame. The Jimmy V Award is given to someone in sports who has overcome great obstacles through perseverance and determination. It is named for Jim Valvano, the North Carolina State coach who gave an emotional acceptance speech at the 1993 ESPYS that included his famous words "Don't Give Up ... Don't Ever Give Up!" He died of cancer later that year.